"Look, if I don't take it, there are ten others who will. What do you think it will change?" While a film may often have a satisfyingly complex structure, fragmenting time and memory in a complicated manner, a director risks alienating his audience if there is little substance behind the complexity. In other words, a Chinese puzzle box that contains nothing at all is little more than frustration for its own sake. 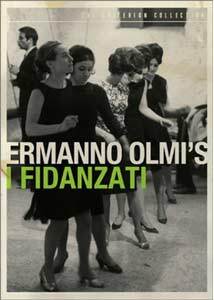 Such is the case with Milanese director Ermanno Olmi's I Fidanzati (The Fiancés). Construction worker Giovanni (Carlo Cabrini) is offered a promotion and higher pay, but it means moving from northern Italy to Sicily for a year and a half, leaving behind his longtime fiancée Liliana (Anna Canzi). He takes the job anyway, and finds that his life in Sicily is a series of disappointments as the higher pay doesn't make up for the higher cost of living on the island and he moves among a series of grim pensiones. Although a series of letters expresses a hope of a deeper relationship ahead, a sudden furious storm symbolizes that this hope is a vain one. That's really about all that happens in this interminable film that actually only runs 77 minutes. From the endless opening dancehall sequence (anticipating a similarly endless one in The Deer Hunter years later), to a pointless Carnivale sequence to excruciatingly empty bits of Giovanni wandering about Sicily and doing nothing of note, there are lengthy bits of film where nothing at all happens, and the viewer just wishes that something, anything, would provide some interest on the screen. The film lacks a clear narrative thread, making the solution of what exactly the story is a trivial puzzle that is singularly unrewarding. As memories appear on the screen, the only clue to their status as being out of time is the fact that the soundtrack from prior scenes in the present often continues to play, making for a needlessly disorienting experience. Although only the two leads are credited, they hardly seem important. Indeed, they're not even introduced until five and a half minutes into the film, and we never do get a proper introduction to them. Beyond the fact Giovanni is a welder and that he's engaged to Liliana, and has a father with a drinking problem, we learn nothing whatsoever about this couple. Liliana is a veritable cipher and even though there are several tear-stained segments that are apparently supposed to be moving, her status as a nonentity makes it difficult to feel any sympathy for her. Instead she's just an image on the screen with no reality behind her at all. Olmi cast these leads using homely actors, apparently in an attempt to increase their poignance, but again the fact that we learn practically nothing about them causes the viewer not to care much about what happens or whether they have any future together or apart. That is not to say there is nothing of merit here; on occasion there are very striking visuals, such as fields of conical white piles (salt? sand? Who knows, and the director never bothers to inform us), and a gorgeous shot of welding on a tall skeletal structure at nighttime, simulating fireworks. As the film turns epistolary, near the end, we finally get an extended segment that resembles something of interest, though the supplements shoot something of a hole in its significance. The result is complicated for its own sake, and has the air of a needlessly intricate puzzle without any substance behind it. Olmi has nothing profound or even vaguely interesting to say about these people, and the viewer has no reason to give a hoot about them in any event. The result is all style and devoid of substance, and the grades fall into place accordingly. Image Transfer Review: The anamorphic widescreen image is nicely transferred. Though there is heavy grain (apparently in the original positive print), the video is quite clean, with few speckles and no serious damage. Black levels are deep, with a decent greyscale for the most part. Difficult patterns, such as Liliana's coat, are rendered flawlessly, indicating a fine eye for detail in the compression process. The result is visually quite pleasing. Audio Transfer Review: The 1.0 audio is not quite as happily restored. Hiss and noise are very prominent throughout. The music has a tinny and unpleasant sound, with a tendency to be shrill and piercing. It's quite lacking in bass. Dialogue for the most part is clean, since it was probably inserted through ADR, as is typical for Italian film. The foley effects seem to be rather overprominent, but don't sound bad. Extras Review: There are a few extras present, and they are key to fathoming this work. A brief essay by Kent Jones lays out the basic plot, such as it is, while an interview (18m:58s) with the director helps to clear up a number of other questions. But the explanations carry with them a number of other problems, such as the revelation that the last 20 minutes are essentially a fantasy sequence, although there are no cues onscreen to this effect. Between them, one can make a certain amount of sense out of the picture, but the result is still not worth the trouble. Olmi takes aim at his critics, but completely misses the point about their critique that he is unable to bring comments about the working classes to the audience. He insists that since he has a blue collar background himself, he understands that life better than the critics. But that's not the essential problem that the critics seem to be referring to, but his inability to say anything about the life of workers in a comprehensible manner. Had he given more attention to his subject instead of focusing entirely on his stylistic labyrinth, this might not have been the case. A beaten-up anamorphic widescreen trailer rounds out the package. A frustrating and ultimately pointless exercise in complicated filmmaking, given a good visual transfer by Criterion. The supplements are key to unlocking the puzzle, which is rather like having to have a joke explained. Skip it unless you have way too much time on your hands.